When I was 16, while I was no PhD in Dictatorships, I did know enough to be sure that what happened was very real and very wrong. What was missing was the conviction to speak up about and act on it. 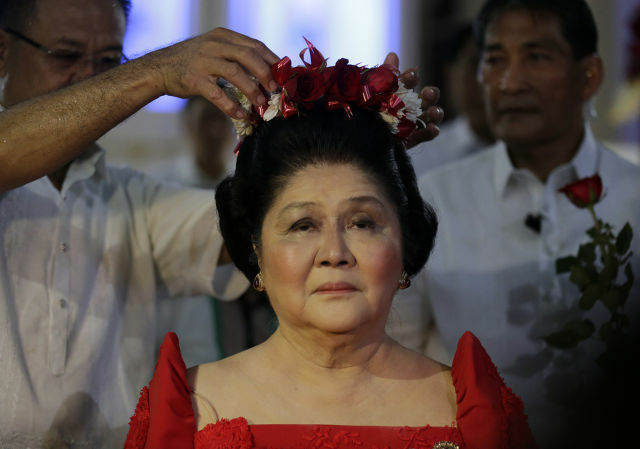 I interviewed Imelda Marcos – the shoe hound, the Iron Butterfly, the disco-dancing detestation of the desaparecidos – in 2001, when I was 16 years old. I’m 30 now, and as the 30th anniversary of the EDSA Revolution draws near, I can’t help but look back at what amounts to one of the weirdest footnotes of my life and see if I can still take something from it. I was a creative writing major at the Philippine High School for the Arts (PHSA) in Mount Makiling, which was founded by Imelda along with the National Arts Center in 1977. 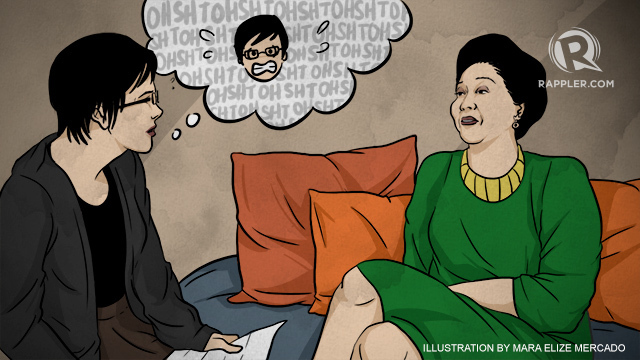 On the school’s 25th anniversary, we tried, on a whim, to see if we could interview Imelda for Variations, the school paper of which I was editor-in-chief. When I was told that she had agreed, I literally had to lie flat on the floor in shock. At 16, it was incredibly hard to process the gravity of the situation. I knew it was a very big deal; that was very sharp and clear. Growing up, my family would tell me stories of the life I had only just managed to squeak past: the curfews, the carefully curated culture, the thin film of fear that had settled over everything. They told me about the Metrocom patrolling the streets. They taught me what the word “salvage” meant. And they introduced me to the couple that started it all, and told me about how the woman, Imelda, was this beautiful, big bouffant-ed, butterfly-sleeved beast, who used the people’s money to live in jaw-dropping excess. I remember my mom telling me about the Film Center’s construction, about how Imelda supposedly had workers’ bodies buried in the concrete after an accident threatened her already impossible deadline, and it was scarier than any ghost story I had ever heard. But having never experienced life under the Marcoses – being, in fact, part of the very first generation to not have to – still made things more abstract and anecdotal, more removed and theoretical, and that bothered me. I suppose it was a kind of guilt. Or maybe shame. I felt like a fraud coming into that interview. I mean, who was I, this random teenage nerd from a relatively comfortable upper middle-class life, to write a piece on the woman who had gone down in Philippine history as one of its most notorious villains? The interview was set in her heavily-gilded penthouse apartment in Makati, and I came with a modest “crew”: Variations moderator and creative writing teacher Nancy Almonte as adult chaperone, and classmate (and now popular visual artist) Leeroy New as videographer. PHSA’s then-executive director, the late architect Honrado Fernandez, would also drop by to round up our group later in the interview. It’s true that Imelda is really something else. She emerged from the hallway looking every bit like she was supposed to: shiny, towering bouffant; an emerald green, butterfly-sleeved terno; a wacky pair of zebra-print high heels (and the clutch to match); ramrod-straight posture; and an impenetrable sense of grace and calm. And she was disarming from the very beginning, calling me “maganda” (beautiful) – which, as a pimply, overweight adolescent, sounded outright ludicrous, though she was a pro at sounding authentic. These expert-level social graces I also expected. But what I really didn’t expect was the emotional roller coaster ride the interview would become. Chalk it up to naiveté. I had in hand what I thought was a very safe set of questions, all of which were about the founding of the school and art in general. I was told by my moderator not to ask anything political, and since I was freaked out and wanted everything to go as painlessly as possible, I had happily obliged. No matter what kind of questions I had, however, it quickly became clear that Imelda was in charge. She hijacked that session and steered it from an innocent chat with a kid to a burning plea for mercy and justice. It was weird from the beginning. If you’ve seen the 2003 documentary “Imelda” by Ramona Diaz, the way Imelda rambled aimlessly to the director about love and peace; and about the true, the good, and the beautiful, was nearly identical to how she started the conversation with me. Imelda also took out a pen and paper and drew a series of hearts and stars and circles to illustrate her philosophies, which at that point looked to me like script from another dimension. Suffice it to say that while I looked calm and busy taking notes on the outside, I was running around and screaming on the inside. Soon enough, however, things got a little too lucid for my taste. She had managed to segue somehow from drawing me random shapes, to talking about renowned pianist Van Cliburn and all the other famous people she’s been with, to recounting the very last thing I had ever hoped she would: the Marcos regime. It took me a moment to realize that this was not a rhetorical question. Imelda, at that point, had begun to stare at me, calmly waiting for me to answer what is, to this day, one of the most frightening questions of my life. I can’t blame you if you find this (and another moment, which I will get to) hard to believe; it’s like it came from the mind of a sadistic scriptwriter. But I promise all of it’s true. They say truth is stranger than fiction, and what we often forget is that it can be a thousand times more terrifying. Instead, I forced a tight, vague little smile and shrugged, but barely. A non-answer at best, an act of cowardice at worst. And whatever bodily spasm it was that I made, Imelda didn’t seem to care, and soon went on with her mishmash of New Age-isms and memories of a glorious yesteryear like she hadn’t just thrown me for a loop. It was, in a sense, a missed opportunity. I understand this clearly. Now, at 30 years old, I’ve met quite a few people who probably would have given anything to have been in my place, to have gotten the chance to meet face to face with Imelda in private and tell her how she and her family had done them wrong – and then some. But, like I said, I was essentially a kid, and while I did have a working knowledge of our recent sordid history, I definitely didn’t know what to do with what I knew. Now, if I was dropped into the very same situation today, I probably would have told Imelda stories about people I knew: my friend from college who had never known her father; sisters who were raped and tortured (including having their breasts electrocuted); an old roommate whose earliest childhood memory was in prison with her parents. I don’t know how Imelda would respond to this, but it’s probably the least I could do given that I am now a bit older, more informed, and more certain of my politics and values. It won’t bring anyone back from the dead, but it’s what I know I can do. And it’s this sense of not being able to do enough that speaks volumes about our problem with the past. The generations succeeding the one that suffered under the Marcos regime have grown less and less perturbed over the fact that victims and their families have yet to really get their due, and that we continue to languish under gnarled power structures run by thieves. It’s gotten to the point that whole droves of people who had never experienced martial law deny that anything bad ever happened, and even want to elect Ferdinand Marcos’ son to the second-highest position in the land. It’s not just a problem of education. When I was 16, while I was no PhD in Dictatorships, I did know enough to be sure that what happened was very real and very wrong. What was missing was the conviction to speak up about and act on it. And my 16-year-old self being questioned by Imelda was, in essence, what recent generations continue to be today with regards to our past: unable to properly process what they know, unsure of how to take a stand, and unaccustomed to acting on their beliefs. How we dig ourselves out of this hole is not just about telling people what happened decades ago, but about giving people the right mindset to actually care about it. That’s what we’re missing. The Marcos regime was one of the gravest, most consequential moments in our country’s history, but the fact that we haven’t gone out of our way to set things right, the fact that we pretty much pussyfooted the development of our democracy, and the fact that these facts don’t alarm a lot of people today, may turn out to be the far greater tragedy. Now, there was one more moment during that meeting with Imelda that you might find hard to believe, and I suppose there is no better way to end this piece than to tell it. The interview had finally ended, and we had barely begun our thank yous and goodbyes when Imelda said, “But where are you going? We’re having lunch at the Peninsula.” Minutes later, I found myself crammed into the back of Imelda’s luxury sedan (yes, there were 3 of us literally squished in next to her, FX-style – marunong si Madame makisiksik! ), wondering if eating this lunch meant partaking of the stolen billions. I was the last to step out of the car at the hotel driveway, and saw that Imelda had barely entered the place before a crowd of old women were tittering around her and asking for pictures. And then, just before I was about to close the car door, I noticed something on the backseat’s stark white upholstery, right on the spot where I’d been sitting. It was a spot of blood. I checked my skirt and realized that I had gotten my period. Tinagusan ako sa kotse ni Imelda Marcos. Blood was literally spilled. Now, it has taken me over a decade to try and write this essay, because the events of that day, especially the one I’d just mentioned, had really needed time and maturity to process. And one would think that life had handed me what appears to be a damning metaphor with that spot of blood, but over years of trying to write this piece, I had always found it too on-the-nose. Too trite. So I’d always had trouble figuring out what to do with it. Think about it: what was I going to say? That staining Imelda’s car with the blood from my womb was my battlecry on behalf of all who have suffered? Because it wasn’t. Because our issues with martial law and its aftermath have to stop being just this mess of symbolism and theory. And it has to stop revolving around a single day in February when we just bow our heads and sigh. It is something tangible; it is something that continues to affect us – to hurt us – every single day. It is evident in our politics, our poverty. We step out of our homes each day and have to face the tragedy that is our status quo.